Quality Mix provides a continuous and precise mixtuere of medical Air ans Oxygen for infants, children and adults. 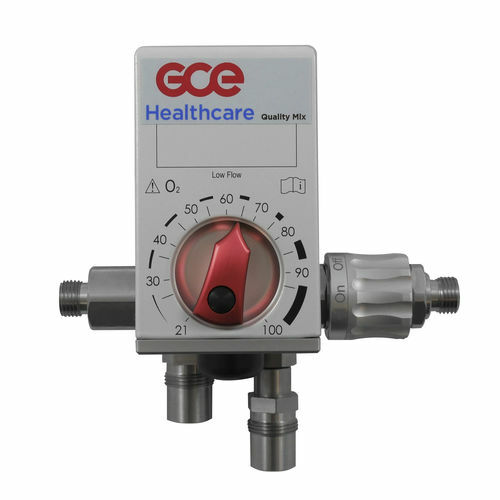 The exact O concentration is easy to ajust and an optional bleed swich enables very low gas consumption, even with flow rates of less than 31/pm. A Pressure Alarm sounds if there is any interruption or pressure drop in the gas supply system. The device can be configure individually and according to specific needs enabled through a sophisticated modular system which includes a regulator module, rail clamps, seberal flowmeters and silencers. To facilitace the installation you can use other GCE products such as regulators, combination valves and low pressure hoses.